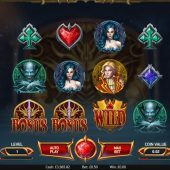 Blood Suckers 2 slot is the sequel to Netent's Blood Suckers, a slot with a famously high RTP in excess of 97% and equally famous low volatility that usually finds itself top of the casinos' lists of games excluded when under a bonus wagering requirement! 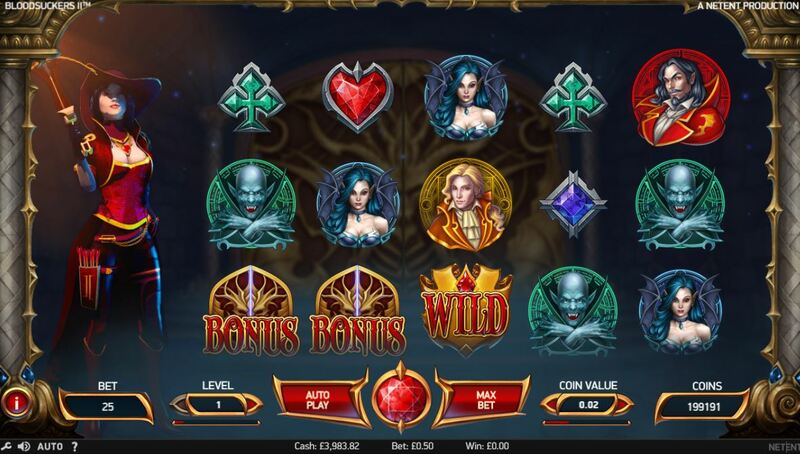 We have the same 25 pay line format over 5 reels and 3 rows here too but here a rather more Gothic feel to the game, similar to that of Microgaming's Immortal Romance. But has Blood Suckers 2 got the same sort of bite, as the original? We have transparent reels over the background of a dark castle room, while the lady warrior in red, The blood sucking Amilia, stands menacingly on the left of the reels, her crossbow ready for some bloodshed. The card symbols take the form of stained glass windows and the Princess with her friends make the character symbols, aside from one - the terrible green demon! The graphics are very detailed, smooth and polished, certainly an improvement on the original. The sound of slashing blades accompanies the reels and portentous music forms the game's underscore. The Wild symbol as titled forms the best 5-of-a-kind win at a deadly 400x stake while 5 scatters pay 100x. The best character icon is the Red Earl at 20x bet down to the lowest card icon at 4x bet. There are also bonus symbols for a second feature which have no pay assigned. If you trigger this with 4 Bonus symbols wins are doubled, with 5 they are trebled. You do get a couple of random in-play events: Amilia may fire a fiery bolt onto the reels when 2 scatters have appeared and possibly expose the third necessary for the free spins. This can also occur in respect of the 'Bonus' scatters when 2 of the first 3 reels land with them. We stumble into danger when landing 3 or more 'Bonus' icons on successive reels left-to-right. This results in a dangerous trip through underground crypts to break open coffins and receive small coin awards of 1x bet or more, hoping to find the Jewelled Axe and go straight to the next level. What we don't want is the Demon to emerge and kill our progress! Getting to the end of the labyrinth of crypts defeats the Demon and gets you a 1000x line bet (40x stake) bonus. If you trigger this feature with 4 Bonus symbols wins are doubled, with 5 they are trebled. You can also pick up free spin scatters too, and if collecting 3 you get those afterwards! 3 or more scatter icons will trigger 10 free games with all prizes tripled. They can be retriggered but you don't see Amilia on the left with her crossbow during them, nor do the Bonus scatters appear - these are replaced seemingly by extra Wilds symbols.